Sarah Nader - snader@shawmedia.com Jacobs' Kylie Skepnek (left) and Haley Steinkamp have been selected as the 2017 Northwest Herald's girls tennis players of the year. They lost in the first round at state and went 2-2 overall during the state finals weekend. 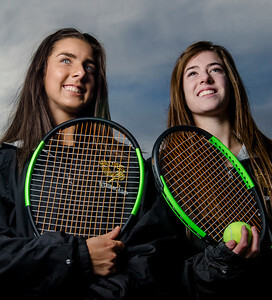 Sarah Nader - snader@shawmedia.com Jacobs' Haley Steinkamp (left) and Kylie Skepnek have been selected as the 2017 Northwest Herald's girls tennis players of the year. 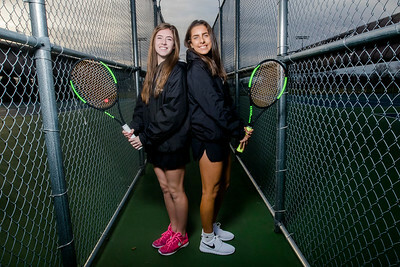 They won the FVC doubles tournament and won a sectional doubles title, qualifying for state. They lost in the first round at state and went 2-2 overall during the state finals weekend. Jacobs' Haley Steinkamp (left) and Kylie Skepnek have been selected as the 2017 Northwest Herald's girls tennis players of the year. 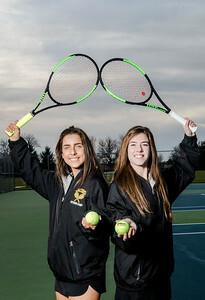 They won the FVC doubles tournament and won a sectional doubles title, qualifying for state. They lost in the first round at state and went 2-2 overall during the state finals weekend.